Professional Drain Cleaning in Gilbert, AZ involves more than cleaning a hair clog from a bathroom sink. The professional plumber finds himself removing roots, debris, and foreign objects from sewer pipes. He observes the major clog first with a CCTV camera attached to a cable and pushed through the sewer line with a commercial mechanical extender like a drum machine. Many times the clog drains can be cleaned by a drum machine with a cutting blade attached to clean out the lateral pipe. A sewer line replaced by trenchless sewer repair or CIPP comes next. A double liner with resin is pulled through the pipe tubing and then inverted by air or water to line the pipe. The resin is then cured by Ultra Violet light or steam to form a tube inside a tube. Each trenchless repair requires unique handling. Should the clogged drains be found to be clogged by grease, hydro jetting with scalding water can Drain Cleaning in Gilbert, AZ / Hydro jetting is an important part of a trenchless repair and can be used to flush the line. This is accomplished by massively pressurized water being flushed through a uniquely designed nozzle. The water is pushed out at 3500 pounds per square inch. The grime is forced into the main sewer line of the public facility. If you are having problems with water backing up and your plunger doesn't seem to help, call a professional Drain Cleaning in Gilbert, AZ plumber to diagnose your problem and give you a free estimate of the service needed to clean your drain. Water backflow can cause health problems. Backflow into your tap water is like having your family drink from the toilet. Clogged Drains can be cleaned quickly, efficiently, and with moderate pricing by your drain cleaning professional. 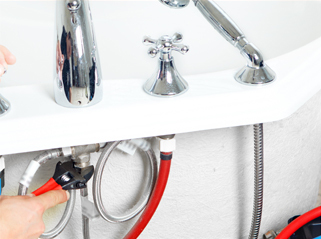 Call your plumber for an immediate and free estimate.